Playing in only his 3rd land-based poker tournament, nightclub owner Issac Galazan won the World Series of Poker (WSOP) $2500 buy-in 6-handed No Limit Hold'em event at the Rio Pavilion Convention Center. Galazan, who referred to himself as "The General" and "Issac G," outlasted a field of 548 players to collect the first place prize of $315,125 and the coveted gold bracelet. 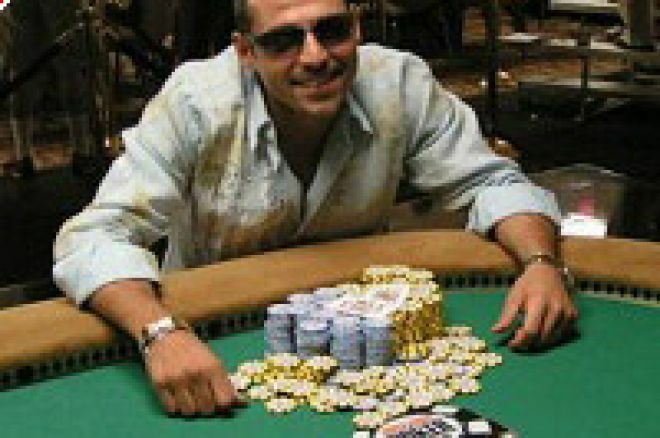 A native of Miami who now lives in Bangkok, Thailand, Galazan pulled off one of the most shocking upsets in the history of the WSOP when he defeated the 18th place finisher of the 2004 WSOP World Championship main event, Harry Demetriou of London, England, in an heads-up match that lasted only 12 hands. Demetriou, who started the heads-up match with about a 5-to-3 chip advantage, lost most of his chips to Galazan on Hand 90, the 10th hand of heads-up play. With blinds at 3000-6000, Demetriou called from the button and Galazan checked. On a flop of 2h 6c 5s, Galazan continued his pattern of overbetting the pot all afternoon and evening by betting 30000. Demetriou raised to 90000 and Galazan quickly moved all-in. Demetriou called instantly and turned over 6d 4s for one pair of sixes with an inside straight draw. Galazan turned over pocket nines, which held up with the Kc came on the turn and the Qh came on the river. "I think (Demetriou) thought I was bluffing," said Galazan. "I thought maybe I went all-in so fast that maybe he thought I was making a desperate move to win the pot." "He (Galazan) could have had anything," said Demetriou regarding his call. "I obviously felt I was in front. Even if I were behind, I had 9 outs. I took the chance to try to win (the tournament) right there...Perhaps I should have played small pots and tried to ground him down." Demetriou was eliminated on Hand 92 when he moved his remaining 150000 chips all-in with Qc 9s and was quickly called by Galazan who turned over Kh Js. The board of 4d 5d 8d 5s 2h were no help for Demetriou, who had to settle for the runner-up prize of $163,850. Professional gambler Tommy Grimes of Houston Texas was eliminated by Galazan on Hand 80. On a flop of Qd Jd 7h, Galazan bet 20000, Grimes raised to 75000, Galazan re-raised all-in, and Grimes called. Galazan turned over Qs 9s for top pair while Grimes turned over Jc 8s for middle pair. Grimes got no help with the Ks on the turn and 3d on the river to finish in 3rd place for a prize of $85,075. David Singer of Mamaroneck, New York was eliminated by Demetriou in Hand 61. Demetriou opened under the guy for 22000 and Singer called from the small blind. On the flop of As Jc 7h, Singer checked, Demetriou bet 55000, and Singer called. Both players checked the turn card of 5c. Singer went all-in for 186,500 total on the river when the 6d came off. Demetriou thought for over 3 minutes before calling with Ah 4h, which were good enough to win the pot against Singer's pocket Nines. Antonio "The Magician" Esfandiari, who arrived at the final table as the short stack, busted out 5th place when he lost a "race situation" against Demetriou. With blinds at 2000-4000, Demetriou opened for 15000, Esfandiari re-raised to 59000, Demetriou announced all-in, and Esfandiari called. Esfandiari's Kd Jc missed against Demetriou's pocket Eights on a board of 4h 3d Qc 6c 4s. Esfandiari earned $63,020 for his 5th place finish. David Barnes of London, England was the first casualty of the final table on Hand 3. Barnes opened for 16000, Demetriou called, Galazan re-raised to 50000, Barnes moved all-in, and Galazan called. Barnes Ah Jh failed to connect against Galazan's pocket Tens on a board of 3h 4s 7h 9c Ks.